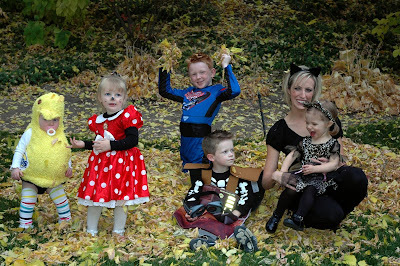 For Halloween we took Ava up to Freddy O and Granny O's house for a Halloween Bash and trick-or-treating. 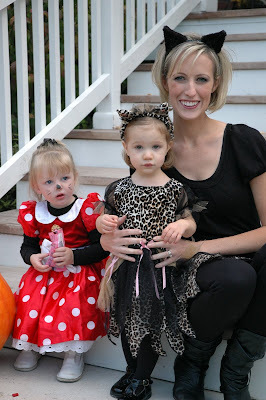 Ava dressed as a leopard, however, we told her she was a kitty cat (her second favorite animal after dogs). Here's Ava on Granny O's front porch checking out the pumpkins, crows, and witch's cauldron. Cousin Annissa, who dressed as Minnie Mouse, was also there for the fun. Annissa got an early start on the Halloween treats. Here's a picture of all the cousins together, along with Krista (because Ava wouldn't be in the picture without her). Sophie was a Peep, Lucas a race car driver, and Seth was WALL-E. Of the 20 pictures Larry took, this is actually the best one. It's quite difficult trying to get five children to sit still and smile for the camera all at once. 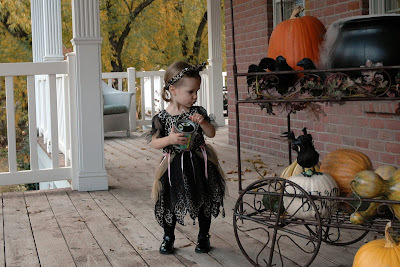 We then took Ava trick-or-treating around the neighborhood for a bit. Afterward, we returned to our own home and gave out Ava's loot to the trick-or-treaters who came by our house. Sorry Ava. You can keep your candy when you're older. That looks like a TON of fun! She made a cute leopard :). She's cute...obviously a bit attached to her mommy huh!! Gotta love that right!! Looks like a fun Halloween!! Wow, that last pic is amazing with all the kids. It looks like a halloween costume add from a magazine (even without everyone smiling and looking at the camera). hahaha that is such a Furr thing to do...give out the candy that you got from other people. Hopefully Ryan won't read this or he'll get the same idea. But I want to eat my kid's candy for the few years I can.